Cerberus is a dark region on Mars that has shrunk down from a continuous length of about 1000 km to roughly three discontinuous spots a few 100 kms in length in less than 20 years. There are two competing processes at work in the Cerberus region that produce the bright and dark features seen in this THEMIS image. Bright dust settles out of the atmosphere, especially after global dust storms, depositing a layer just thick enough to brighten the dark surfaces. Deposition occurs preferentially in the low wind "shadow zones" within craters and downwind of crater rims, producing the bright streaks. The direction of the streaks clearly indicates that the dominant winds come from the northeast. Dust deposition would completely blot out the dark areas if it were not for the action of wind-blown sand grains scouring the surface and lifting the dust back into the atmosphere. Again, the shadow zones are protected from the blowing sand, preserving the bright layer of dust. Also visible in this image are lava flow features extending from the flanks of the huge Elysium volcanoes to the northwest. Two shallow channels and a raised flow lobe are just barely discernible. The lava channel in the middle of the image crosses the boundary of the bright and dark surfaces without any obvious change in its morphology. 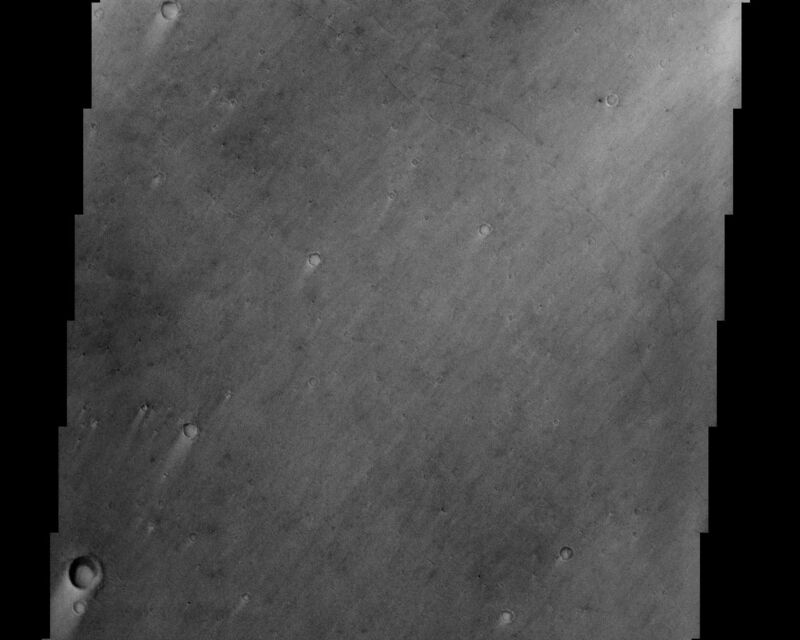 This demonstrates that the bright dust layer is very thin in this location, perhaps as little as a few millimeters. Mars is an ever-changing land of spectacular contrasts. 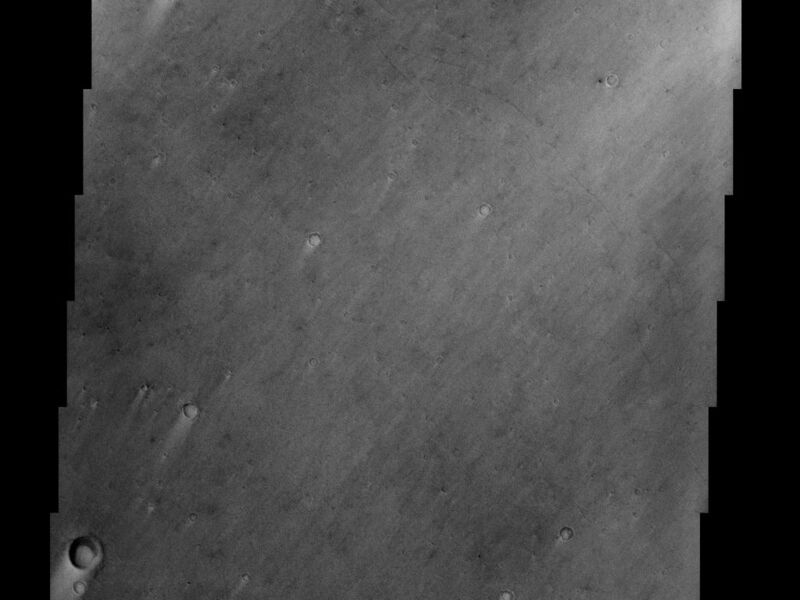 This THEMIS image shows the Cerberus region of Mars, a dark area located near the Elysium volcanoes and fittingly named after the three-headed, dragon-tailed dog who guards the door of the underworld. Two opposing processes are at work here: a thin layer of dust falling from the atmosphere and/or dust storms creating brighter surface areas (e.g. the top left portion of this image) and dust being scoured away by the action of the Martian wind disturbing the sand grains and freeing the lighter dust to fly away once more (the darker portions of this image). There are, however, some darker areas that are somewhat shielded and protected from the wind that have yielded bright, dusty crater floors and wind streaks that trail out behind the craters. These wind streaks tell a story all their own as to the prevailing wind direction coming from the northeast. 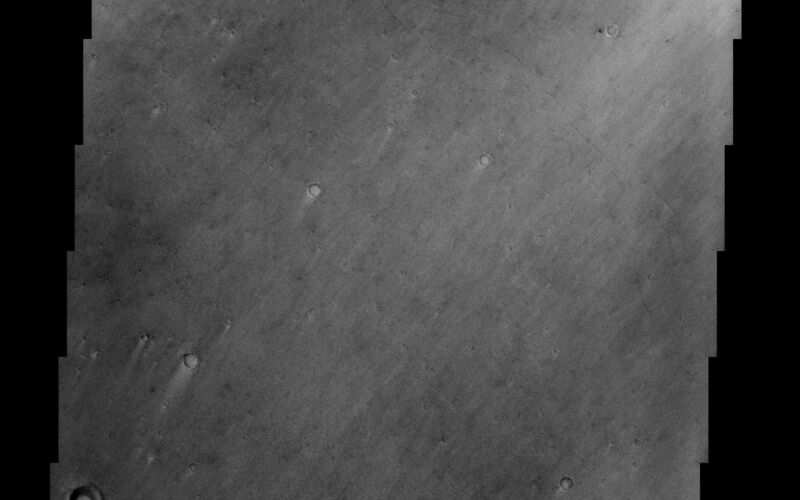 This, added to the fact that this dark region was once 1000 km in length and has dwindled to just a few isolated dark splotches of 100 kilometers in the past 20 years, help us to see that the Martian environment is still quite dynamic and capable of changing. Finally, this being a volcanic region, a lobe of a lava flow from the immense Elysium volcanoes to the northwest is visible stretching across the bottom one-quarter of the image.